Harbor Lakes offers many historical, cultural, and recreational entertainment opportunities close by. This community is a wonderful place to live and to call home. 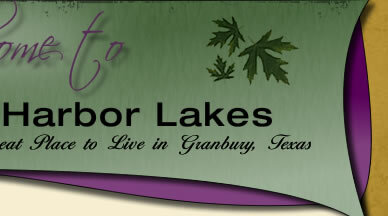 Harbor Lakes Homeowners Association, Inc. is a Texas non-profit corporation. The association was established for the maintenance of the common areas and to provide architectural control and compliance with the covenants, conditions and restrictions of the Declaration. Association members may obtain a copy of the Declaration by clicking on the preceding links or on the "Documents" link to the left. You may also contact Texas Star Community Management directly at (469) 899-1000.